OOTP is better than ever along with huge graphical improvements. OOTP is better than ever, and also features huge graphical improvements. Since I reviewed OOTP 18 last year, it was almost compulsory to review Out of the Park Baseball 19 this year. Orders from upstairs? No, I just enjoy the hell out of playing it. OOTP Baseball is the definitive professional baseball game — which, by the way, is endorsed by Major League Baseball. As I’ve mentioned before, playing a professional game without that game’s governing body’s consent… is not a home run. Having to play with the Philadelphia Pigeons or the Boston Bow Ties just doesn’t work for me. First and foremost, it looks a ton better — which means it feels better and more realistic. Rarely do I mention graphics this early in a review, but it’s absolutely necessary this time. Most, but not all, of the additions deal with graphics. The work they did with the 3D animation makes it feel like a different game. Just the way the players move around is a lot more lively than last year’s models. I kept the same teams as last year with one exception. I switched from the Cincinnati Reds to the Texas Rangers as my MLB team — which is both GM and Manager. 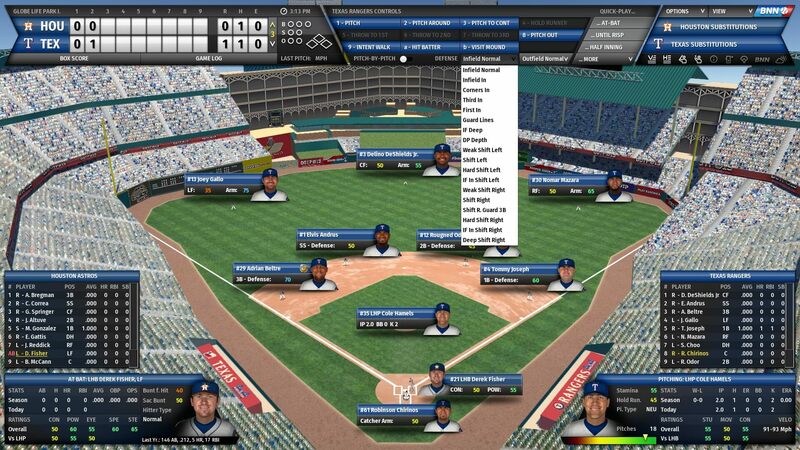 I kept the OOTP Manager-only game coaching the Midland Rockhounds of the AA Texas League. My General-Manager-only game is as the GM of the Alpine Cowboys of the Pecos League, a part of the US Independent League. Rockhounds may pull this one out. My Alpine team doing very well. This year though, I ended up with two fictional leagues as well. OOTP 19 says there are “800 new fictional team logos”. I’ll just believe them since I wasn’t going to count them all. You can create a league in any manner you want. It’s extremely easy to start a new league, set the parameters and customize your own team. Well, for most people. However, I have to spend, literally hours, piddling with every aspect of the uniforms. I have to find the perfect logos (hat, uniform, etc.) and adjust both the home and away uniforms. Which color combinations? How about ‘this blue’ here? Do I want pinstripes on one or both? What size stripes? I could just play in the team customization forever. The microscopic town I live in was even available! I didn’t use it, but I looked up all kinds of tiny, backwoods towns — and they were all there, available for use. OOTP 19 improved the AI as well. While I am no way an expert (or really that good, actually), I am not faring as well as I did last year. They’ve definitely thrown some curveballs my way. Pun intended. In addition, they’ve also expanded the in-game strategy design, as well as the way two-way players are handled. They’ve really advanced the player creation and development system. They improved the way team chemistry system and player morale work. There’s better league news, play-by-play information and game recaps. There is also a completely new scouting system which makes it a lot easier to study and assess players. <Pant, pant> That’s not even all of the improvements, I just got so excited typing-telling you about them. You get to vote for End-of-Season Awards — including the Cy Young Award and the MVP Award, among others. Of course, the expanded AI votes as well, so you’re up against it too. Hopefully, you’ve acquired or developed some guys which can even be considered to be in the running for some of the awards. My first season with the Rangers didn’t go so well. Umm, no awards for any of my guys. Finally, you can set up tournaments and have the options to pick any teams in history — meaning you could possibly have a 64-team setup, with any squad/lineup from 1871-2017. I was simply floored by this ability. I just started a World Series between the 1908 Detroit Tigers against the 1947 Brooklyn Dodgers. Brooklyn won the first game. Of course, that also means I have Ty Cobb and Jackie Robinson in the same game. Amazing. What a pair of lineups! If you have OOTP 18, you can import your games from it as well! As much fun as I had with last year’s edition, OOTP 19 just blew me away. There’s a litany of vast improvements, as well as some overhauls that make this year’s so much more enjoyable. Baseball fanatics are known for both their knowledge and the pleasure they take in statistics. OOTP 19 has the most comprehensive database I’ve ever seen from any sports game. It’s all so easily accessible, deep and comprehensive. Just like all of the available options, the entertainment is limitless. OOTP 19 is available now on Windows, Mac and Linux. A play in progress, with live play-by-play! One of my many baseball cards. Cowboys back on the field.